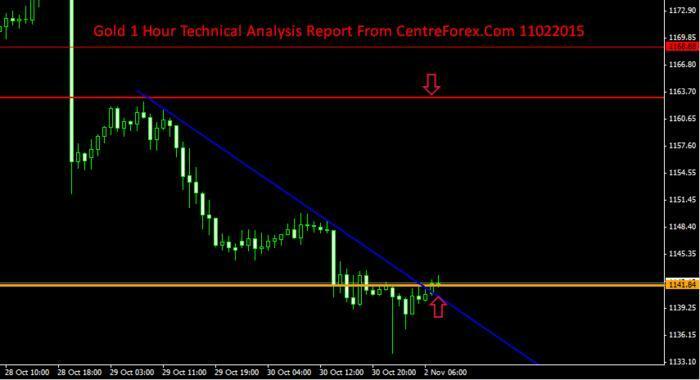 Our Preference: Sell below 1200 levels for the target 1180 and 1170 levels with tight stoploss of 1210. Technical Commentary :- In Daily chart and In 4 hour chart :- Gold was trading in the range bound pattern between key resistance and key support levels and it was trading below the upper trend line, so further we can except upto next key support levels 1170 and 1160 levels. 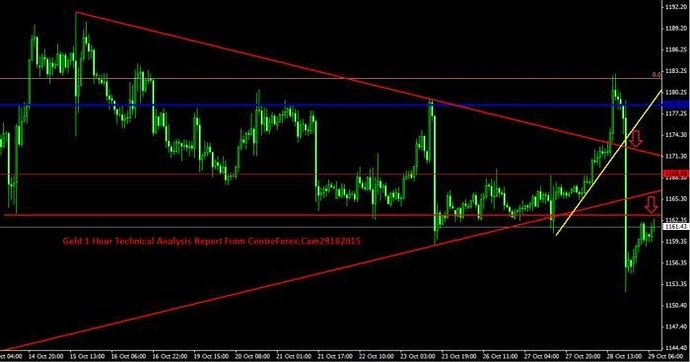 1 hour chart :- Gold was trading in the triangle pattern and the pair trading near key resistance level ,so we can sell near key resistance level :- which we have shown in attached image. 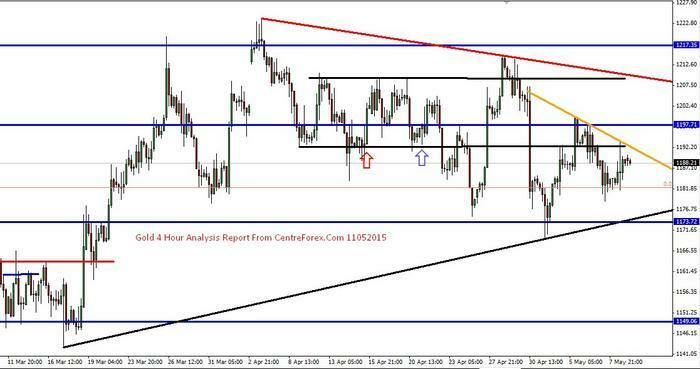 Our Preference: Sell below 1192 levels for the target 1180 and 1170 levels with tight stoploss . 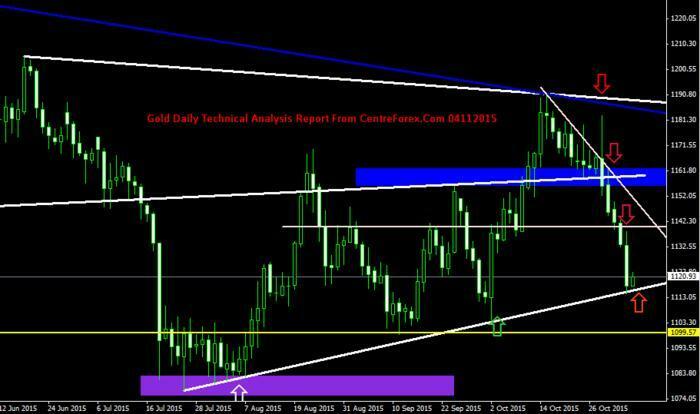 Technical Commentary :- In Daily chart :- Gold was trading in the range bound pattern between key resistance and key support levels and gold was trading in the triangle pattern and now the pair gold was trading near key support level. In 4 hour chart and 1 hour chart :- Gold was trading in the triangle pattern and intraday range bond pattern was broken on lower side so we can except upto next key support level 1174 levels :- which we have shown in attached image. 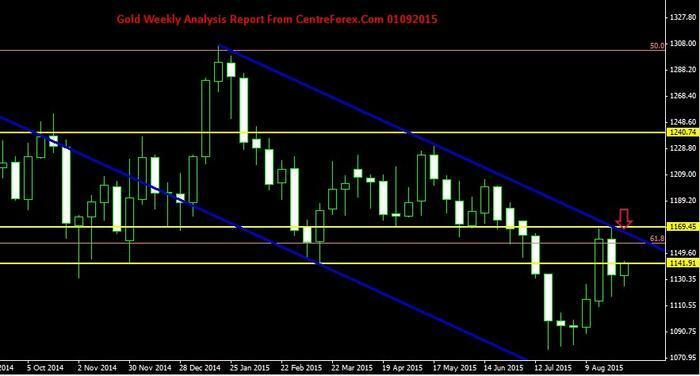 Our Preference: Sell Below 1195 levels for the target 1180 with tight stoploss of 1200. 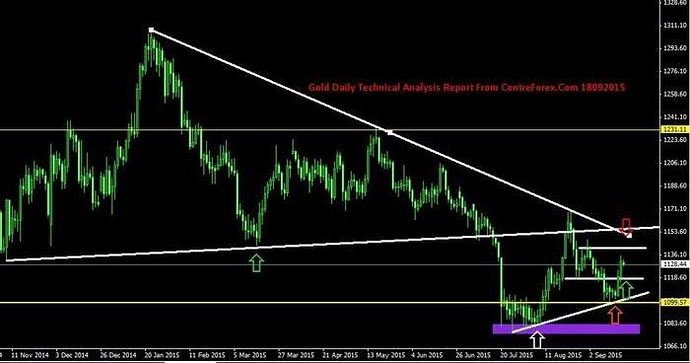 Technical Commentary :- In Daily chart :- Yesterday Gold was broken the trend line on lower side and its broken the key support level so its confirm for selling side so we can except next key support level of 1180. In 4 hour chart :- Gold was broken the key support level and now its moving towards lower trend line If it breaks lower trend line means further we can except on sell side :- which we have shown in attached image. 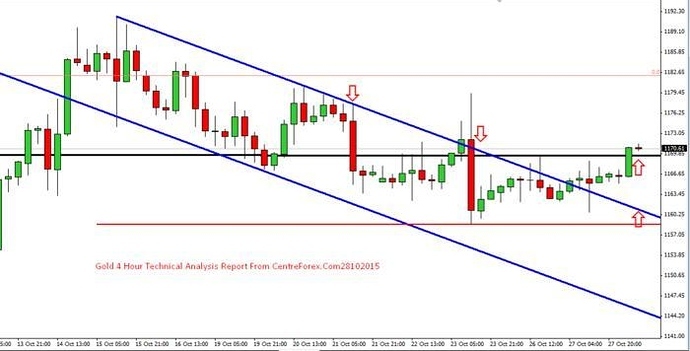 In 1 hour chart :- Gold was trading with equidistance channel lines and yesterday it tested the lower channel line and closing are on above the lower channel lines so we sell near intraday resistance levels. Our Preference: Buy above 1190 Levels for the target 1198 with tight stoploss below 1178. Technical Commentary :- In weekly Chart and In Daily Chart,:- Gold was trading in the triangle pattern now its was trading near lower trend line. 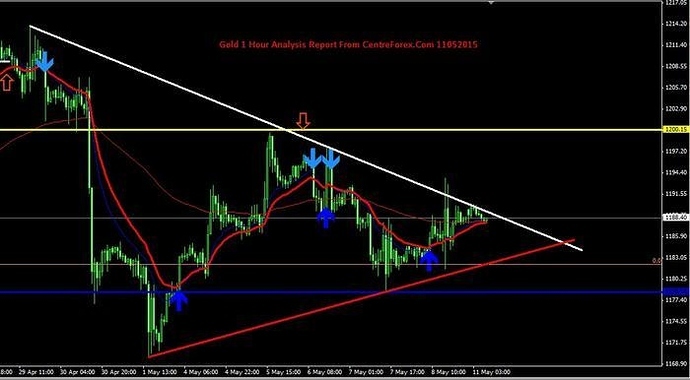 In 4 hour and In 1 hour Chart :- Gold was trading in the triangle pattern , if it breaks lower trend line means we except next major support level of 1180 :- which we have shown in attached image. 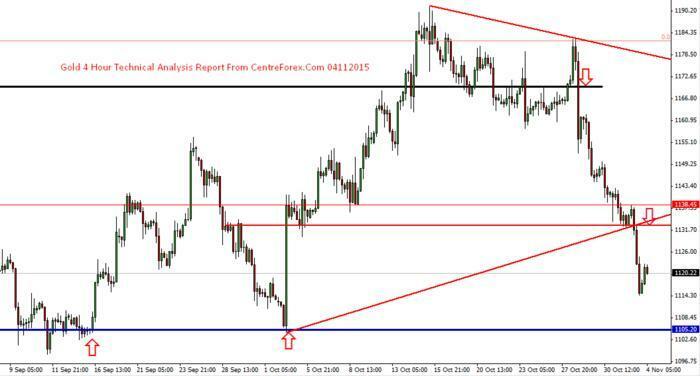 Our Preference: Buy above 1.1200 levels for the target of 1.1350 levels. Alternative Scenario: Sell Below 1.1400 levels for the target of 1.1200 levels. In Daily chart :- Yesterday Eur/Usd was tested the lower trend line and bounce back from lower trend line, so further we can except upto upper trend line and next key resistance levels. Our Preference: Sell Below 1145 levels for the target 1130 & 1120 levels. 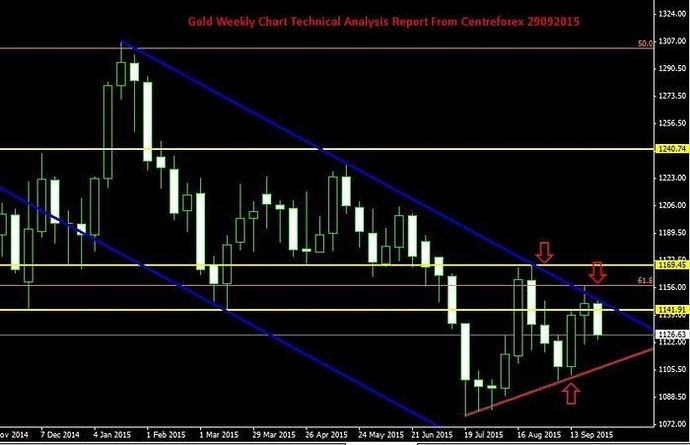 Technical Commentary :- In Weekly chart ;- The gold was trading in the equidistant channel line and trading below the key support level of 1142 and 1170 levels :- which we have shown in attached image. 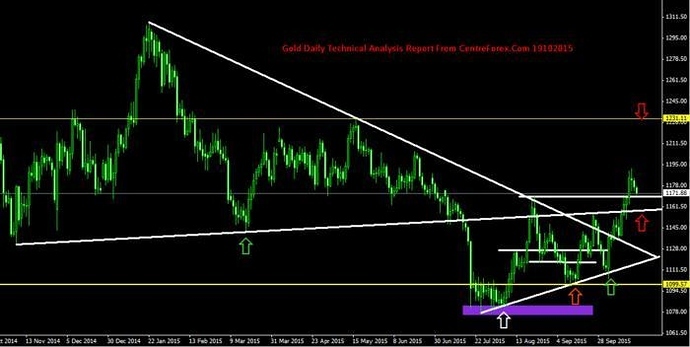 In Daily chart :- Gold was trading in the triangle pattern and trading below the key support level 1160, Gold Major previous key support level 1142, so we can except on selling side upto next key support levels. In 4 hour chart :- Gold was moving with lower trend line and now it was trading in the resistance level 1143 :- which we have shown in attached image. 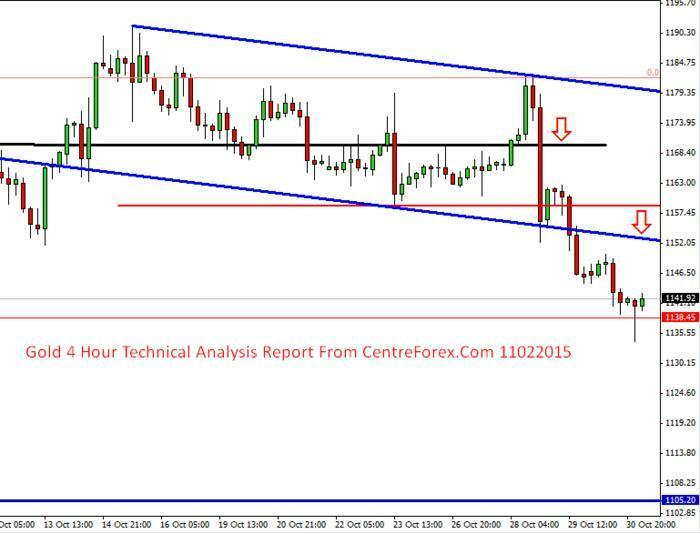 [B]Our Preference:[/B] Sell Below 1145 levels for the target 1130 & 1120 levels. 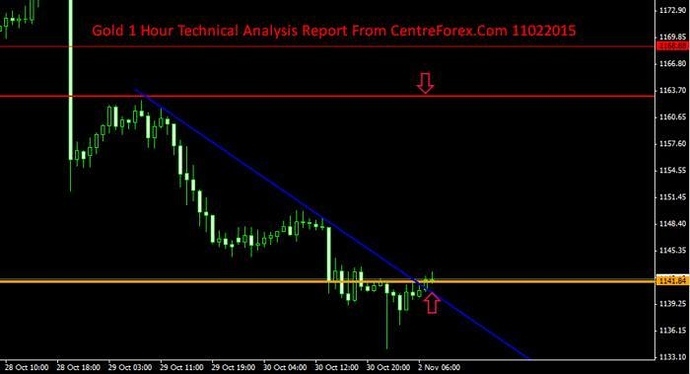 [B]In 4 hour chart [/B]:- Gold was moving with lower trend line and now it was trading near resistance 1143 levels so we can sell near intraday resistance :- which we have shown in attached image. [B]In 1 hour chart :[/B]- Gold was trading with equidistant channel lines and its was trading with upper trend line so we can sell near upper trend line upto next key support levels. 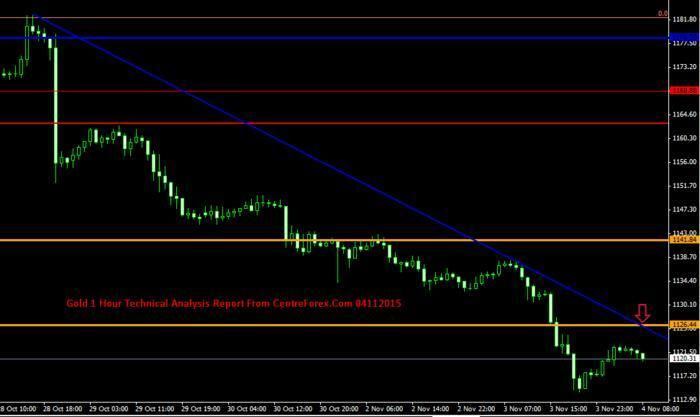 [B]Our Preference:[/B] Sell Below 1138 levels for the target 1120 levels. 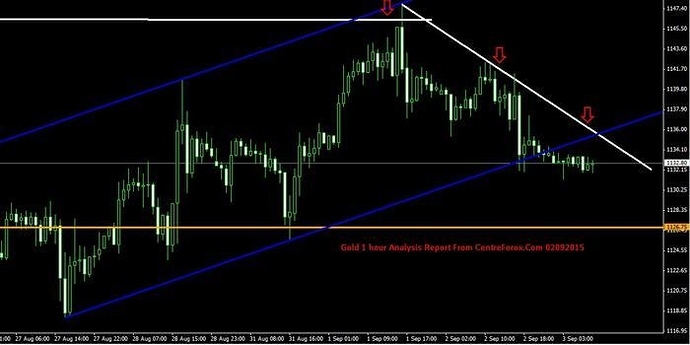 [B] In 4 hour chart[/B] :- Gold was testing the lower trend line, After testing back from key resistance level the gold was closed on lower side so we can except that to break on lower trend line :- which we have shown in attached image. 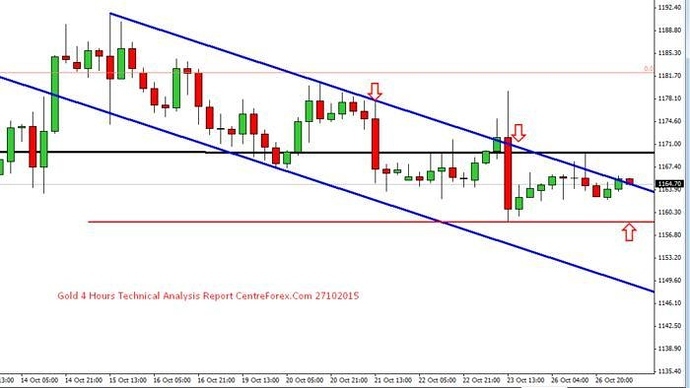 [B]In 1 hour chart[/B] :- Gold was broken the equidistant channel lines on lower side so its confirming for the selling side , so we can sell near intraday résistance levels upto next key support levels. 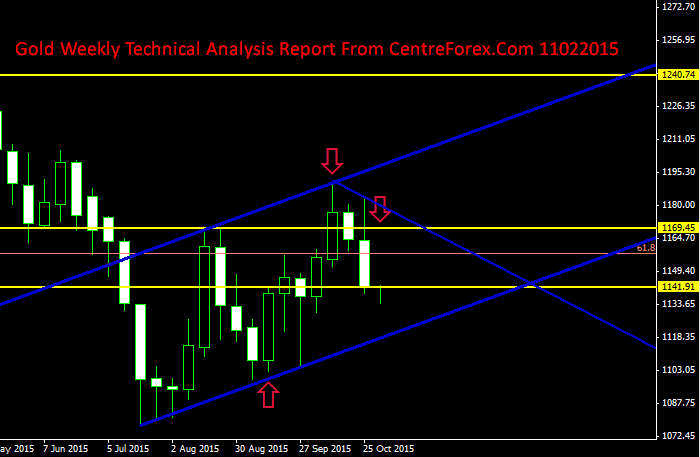 [B]Our Preference[/B]: Buy Above 1115 levels for the target 1127 & 1132 levels. 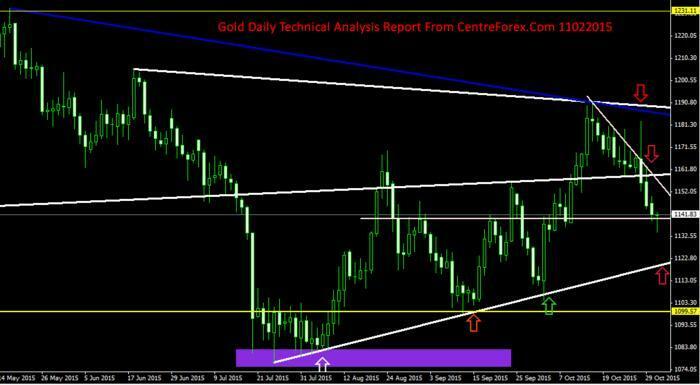 [B]Technical Commentary [/B]:- In Daily chart :- Gold was broken the triangle pattern on upper side and its moving towards upper side, after testing the lower trend line and its was bounced back and its was closed on higher side so its confirming for the buying zone :- which we have shown in attached image. [B] In 4 hour chart :-[/B] Gold was broken the upper trend line and now its moving with new triangle pattern so we can buy near intraday support levels :- which we have shown in attached image. [B]In 1 hour chart [/B]:- Gold was trading in the new equidistant channel lines with strong support levels, so we can buy near intraday support levels upto next key support levels. [B]Our Preference:[/B] Buy Above 1124 levels for the target 1132 & 1138 levels. [B]Technical Commentary :[/B]- In Daily chart :- Gold was trading in the long term triangle pattern, yesterday gold was broken the key resistance level 1120 and it was moving with strong lower trend line so its confirming for the buying zone :- which we have shown in attached image. 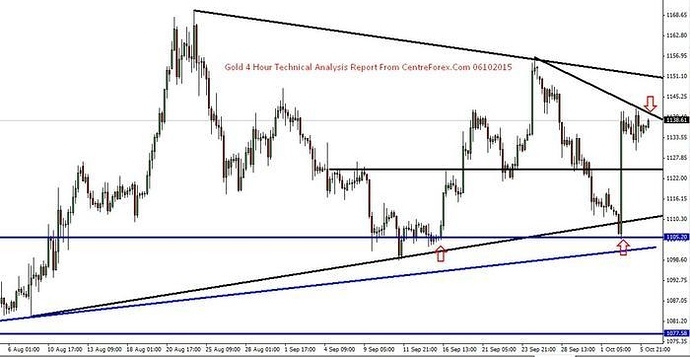 [B] In 4 hour chart [/B]:- Gold was broken the triangle pattern on upper side of upper trend line so this upper trend line acting as now key support level so we can buy near intraday key support levels :- which we have shown in attached image. 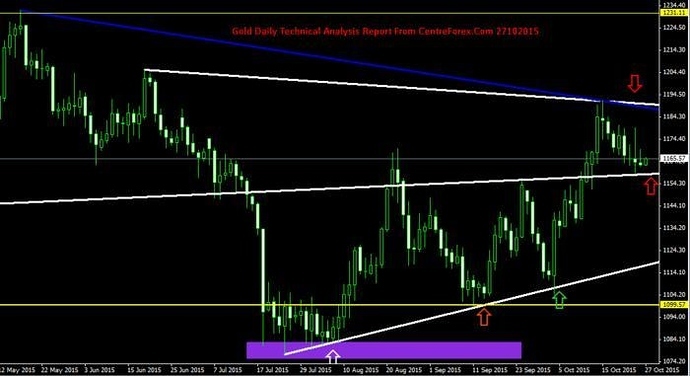 [B]Technical Commentary :[/B]- In Daily chart :- Gold was trading in the long term triangle pattern and now it was trading near key resistance level and trading below new upper trend line so we can keep stoploss above the upper trend line and make move on selling side :- which we have shown in attached image. [B][B]In 4 hour chart :-[/B][/B]:- Gold was moving with the short term and intraday triangle pattern and now its was trading near lower trend lines so if it breaks means we can except correction upto next key support levels :- which we have shown in attached image. 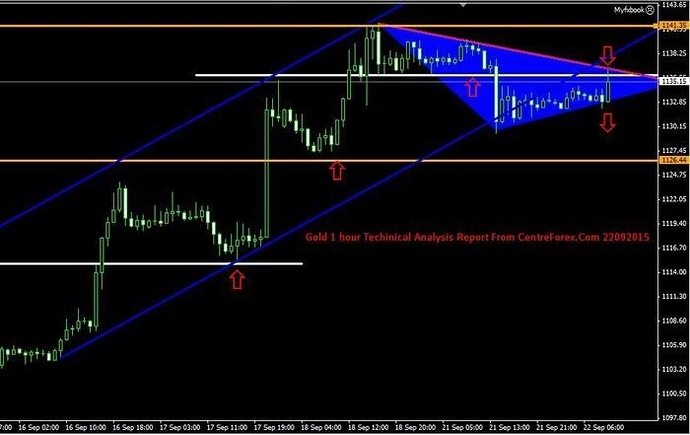 [B]In 1 hour chart[/B] :- Gold was broken the equidistant channel lines on lower side and its trading in the short term triangle pattern lines so if it breaks means we can except correction upto next key support levels :- which we have shown in attached image. 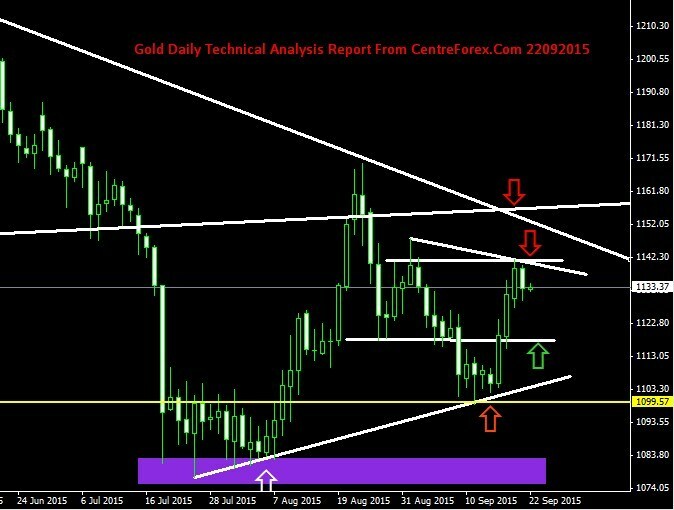 [B]Technical Commentary :[/B]- In Weekly Chart :- Gold was the trading in the equidistant channel lines and its trading with lower trend line and key resistance level 1142 ,If its breaks 1142 levels means we except on buying side for long term. 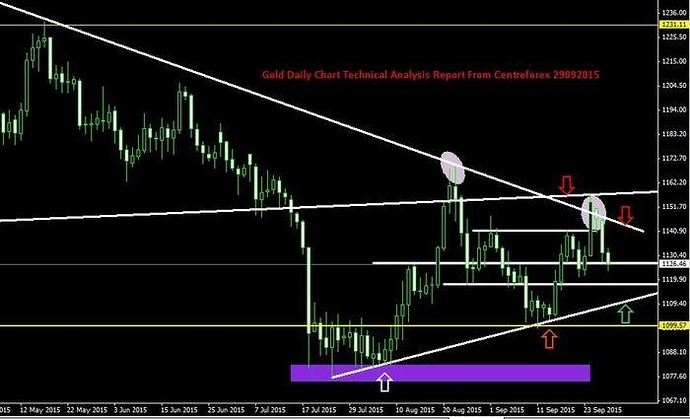 [B] In Daily chart :[/B]- Yesterday gold was closed on lower side with bearish candle and gold was trading in the long tern triangle pattern now gold reached support level, so today we can except on sideways movement between key support level and key resistance levels:- which we have shown in attached image. 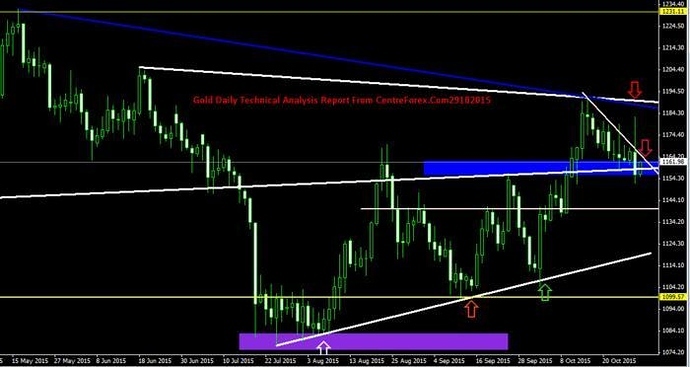 [B] In 4 hour chart :-:-[/B] Gold was trading in the triangle pattern and its trading near lower trend line and key support levels so we can except on buying side:- which we have shown in attached image. [B]In 1 hour chart :-[/B] Gold was trading in the equidistant channel lines and trading near upper trend line and trading above the support levels so we can except on buying side :- which we have shown in attached image. 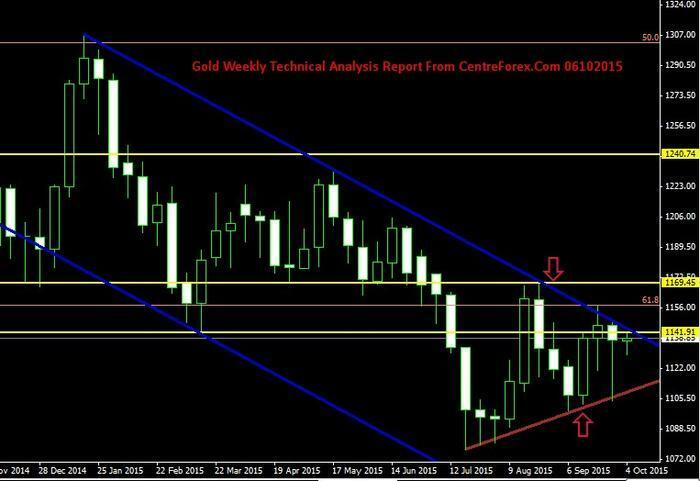 [B]Technical Commentary :-[/B] In Weekly Chart :- Gold was the trading in the equidistant channel lines and its trading with lower trend line and its trading below key resistance level 1144 ,If its breaks 1144 levels means we except on buying side for long term otherwise we can except some correction upto next key support levels 1130 and 1118. 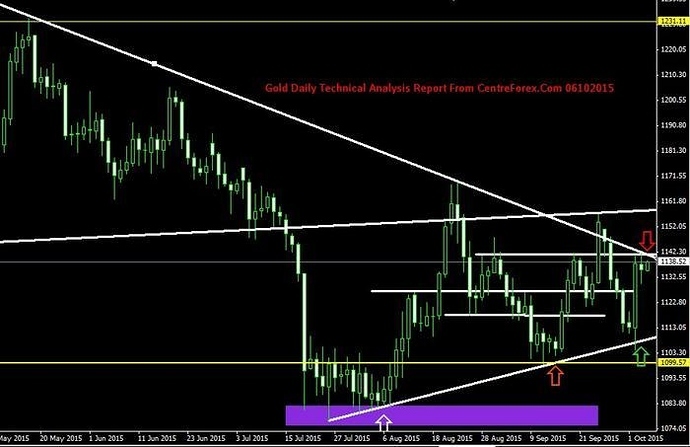 [B] In 4 hour chart :-[/B]:- Gold was trading in the triangle pattern and its trading near upper trend line and key resistance horizontal line was coming around 1144 levels so we can except on buying upto key resistance level 1144 :- which we have shown in attached image. 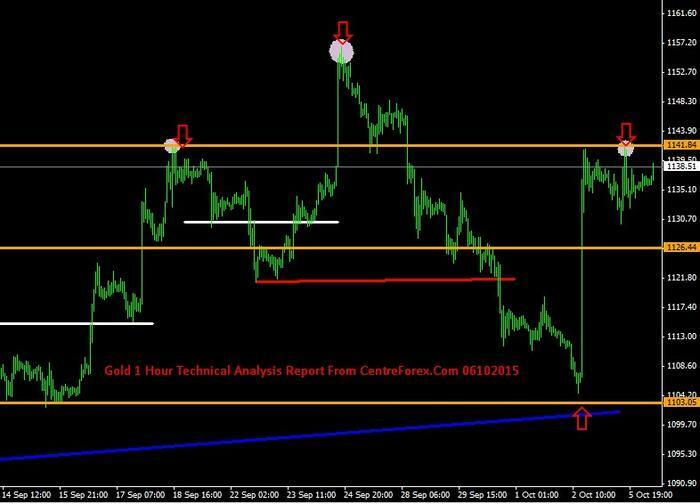 In 1 hour chart [/B]:- Gold was formed head and shoulder pattern , In 1 hour the shoulder was coming around 1142 level, If it close we close above 1142 level means we can go head for buy off upto next intraday resistance level 1148 Alternative Scenario: If we got close below the shoulder means we can except on selling side :- which we have shown in attached image. [B]Technical Commentary [/B]:- In Weekly Chart :- Gold was the trading in the long term equidistant channel lines and last week gold was closed higher side and closed above key resistance level 1170 so we have got good support level of 1170 we except on buying side upto next key resistance level of 1205 levels. 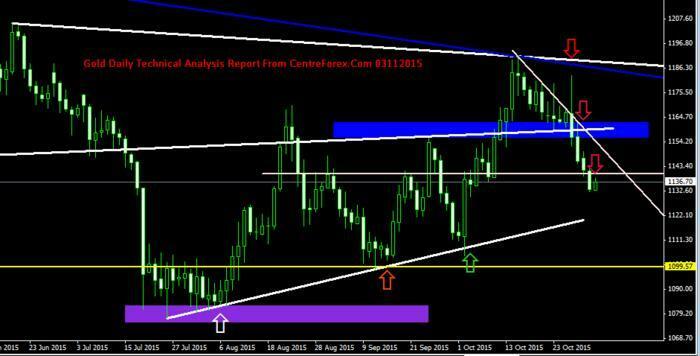 [B]In Daily chart :[/B]- Gold was trading near key support level 1170,Now major previous resistance acting as key support level so today we can except on upper side upto next key resistance levels:- which we have shown in attached image. 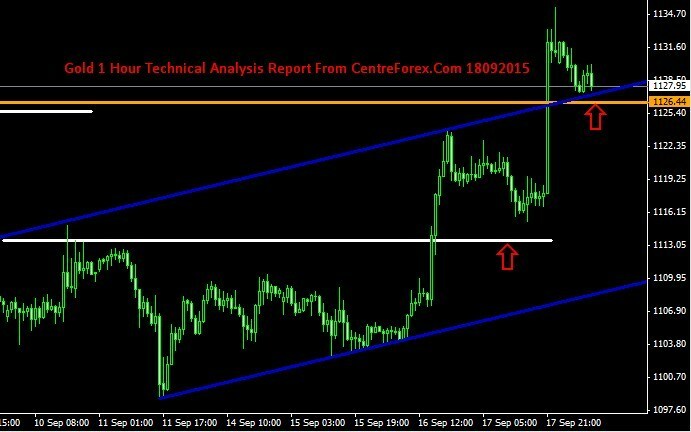 [B]In 4 hour chart :-:[/B]- Gold was trading in the equidistant channel lines and trading above the key support level of 1170 and key resistance horizontal line was coming around 1170 levels so we can except on buying upto key resistance level 1180 and 1205 levels :- which we have shown in attached image. [B]Technical Commentary:[/B]- In Daily Chart :- Gold was trading in the triangle pattern and key support lower trend line was formed now its was trading near the lower trend line and so today we can except on buying side upto next key resistance level:- which we have shown in attached image. Technical Commentary:- In Daily Chart :- Gold was broken the triangle pattern on lower side and yesterday its closed below the lower trend line and now the trend lines acting as the key so today we can except on selling side upto next key support level :- which we have shown in attached image. 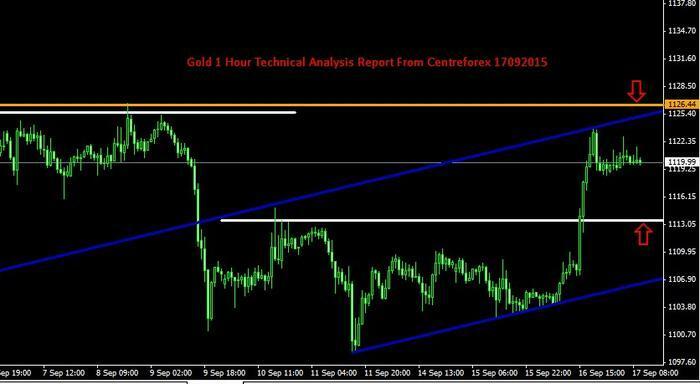 In 4 hour chart :-:- Gold was trading in the equidistant channel lines and its trading below the key resistance level of horizontal line 1162 level and its trading below the intraday lower trend line 1163 and we got closing below the support 1165 level so its confirming for selling side upto next key support 1148 and 1140 levels :- which we have shown in attached image. 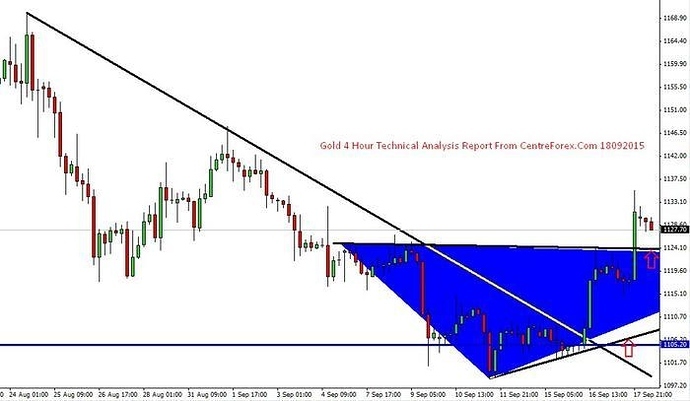 In 1 hour chart :- Gold was broken the triangle pattern on lower side and its trading below the key resistance level of horizontal line 1165 so we can except next support 1145 level :- which we have shown in attached image. In Daily Chart :- Gold was trading in the triangle pattern, the upper trend line was coming near 1152 levels so we can sell below 1152 level and its trading above intraday key support 1142 level If the intraday support level breaks means we can except upto next support levels :- which we have shown in attached image. 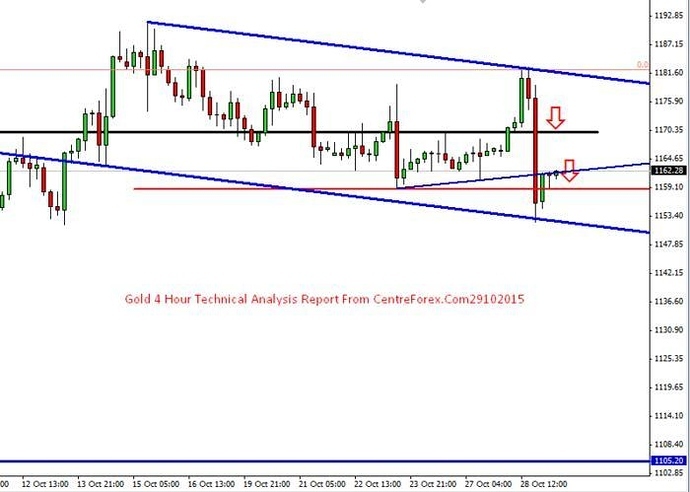 In 4 hour chart :-:- Gold was broken the equidistant channel line on lower side so its confirming for the selling side and key support level was coming around 1142 and 1138 levels :- which we have shown in attached image. 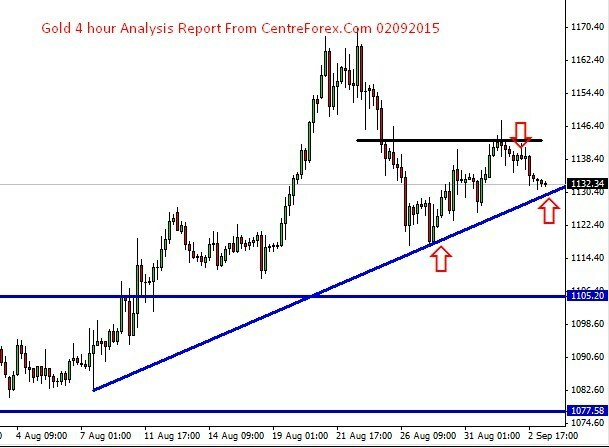 In 1 hour chart :- Gold was with the upper trend line and key support levels :- which we have shown in attached image. 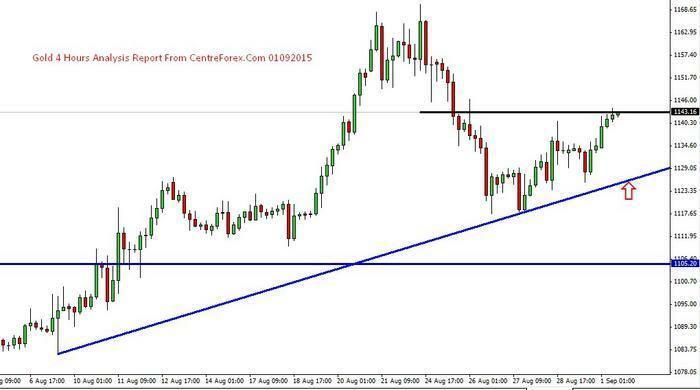 trend line 1120 levels :- which we have shown in attached image. can except some correction upto 1142 levels :- which we have shown in attached image. 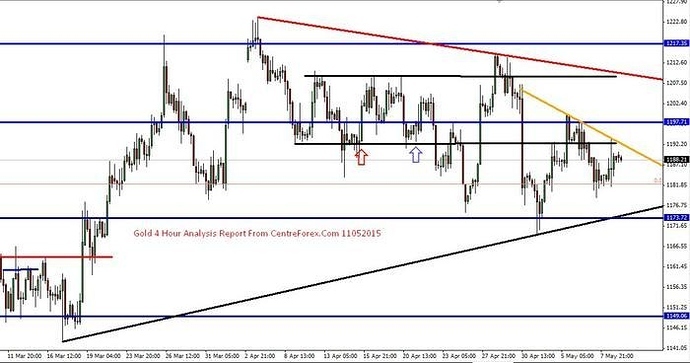 so its confirming for the buying side :- which we have shown in attached image. [B]Our Preference[/B]: Buy above 1124 for the Target of 1130 levels. 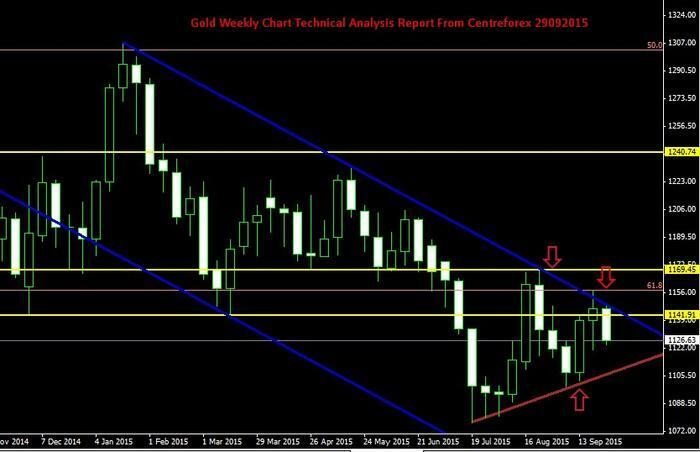 [B]Technical Commentary:- In Daily Chart [/B]:- Yesterday Gold was reached safely to the lower trend line with bearish candle closing If Further breaks yesterday low means we can except some more selling upto next support levels :- which we have shown in attached image. 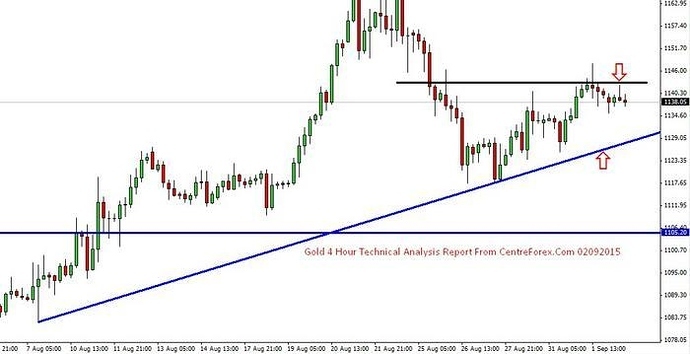 [B] In 4 hour chart :-:[/B]- Yesterday Gold was broken the lower trend line and key support levels so we can except some more selling upto next key support levels:- which we have shown in attached image. [B]In 1 hour chart [/B]:- Gold was trading below the upper trend line and its trading below the key resistance level, If we got closing above the upper trend line means we can except on buying side :- which we have shown in attached image.